Well girls I couldn't let the lead up to Mother's Day go by without a dig at Mr Beach House. 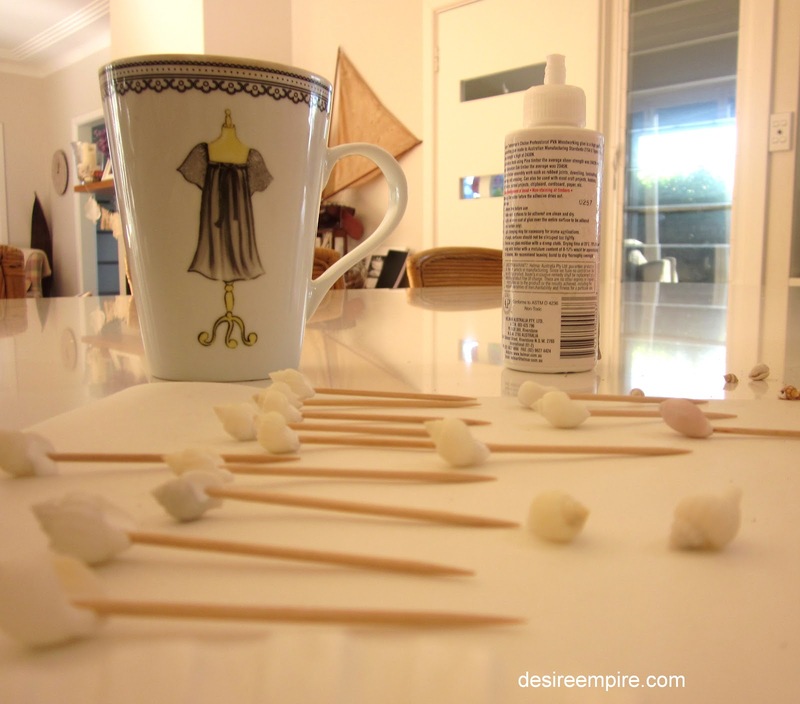 I know you love it when I give him stick on this blog and it appears I am about to do it again today. Now I can hear your mind ticking over from here........You are thinking, but you're not his mother and of course you are right, but that doesn't mean he doesn't act like my number one son lots of the time. The poor man......he has been known to say more than once, "Carolyn if I wanted a beep beep life coach, I would have married one". Hmmmm seems I need to pull back a little on the bossing around and be a little bit more wifely than motherly...... I'm working on it believe me!!!!! But I still want some Mothers Day appreciation from him come mid May. Actually lately there's been a little less of the 'beep beep' from him and a lot more of the nice in my direction. Take last night for example. The man never takes his mobile phone anywhere, it rarely leaves the kitchen drawer......could be something to do with me and wanting to stay uncontactable, Anyway lets just say I knew where he was and I needed to speak to him like yesterday. He was at the gym with his mate and I wanted him to pick up some panadol on the way home. My head was splitting and the medicine cupboard was bare. I rang his mate several times to no avail, dragged myself through the 6 o'clock swill with the Beach House Brats and was collapsed on the couch when he walked through door later in the evening. I told him about my head and blow me down, he offered to venture back out into the night and get me some pain killers.......How sweet. There's also the fact that lately he has been making me a cup of tea and bringing it to me in the media room first thing each morning, as I go through your lovely comments and emails from the night before. I say what????? What the beep beep is going on???? I asked him this morning why he was being so nice to me and was he having an affair???? He just turned on his heel and laughed heartily as he walked off down the hallway. If these gratuitous displays of kindness keep up, I might have to start going through his phone bill. God knows he never uses the mobile phone to call me, and maybe there's someone else. Stranger things have happened. Maybe this new found kindness in my direction is because I let on that I've been face booking old boyfriends and he is slightly worried about that. Whatever the reason, I'll take it, as random acts of kindness are my kind of thing!!!!! Anyway you didn't come here to find out if my husband is having an affair. 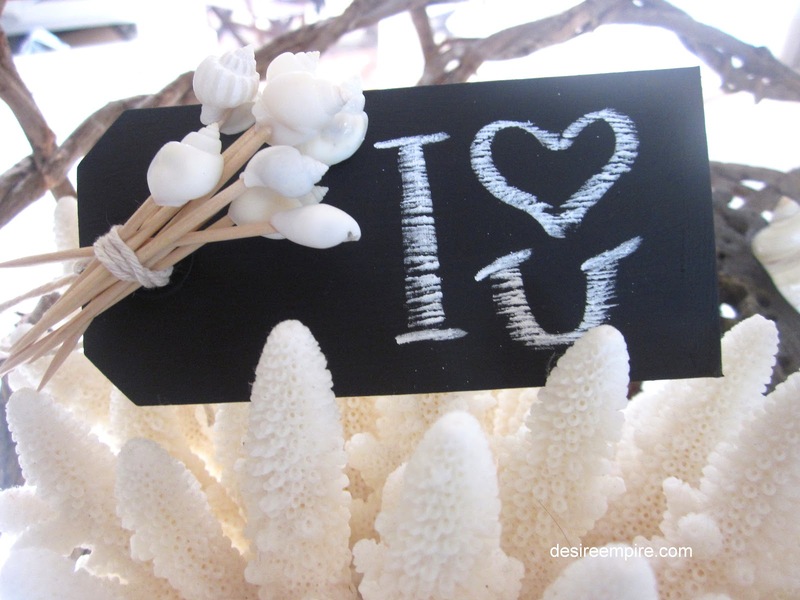 You came here because you love budget coastal ideas you can make for Mothers Day, which are quick and easy to put together and make people believe your are a creative genius. I got this idea from a kitchenware shop that I frequent regularly. The prices nearly always mean I leave there empty handed, but I did make the very sensible decision to buy a scoop of these tiny shells from there some months ago. Let me tell you this is the bag that just keeps on giving. 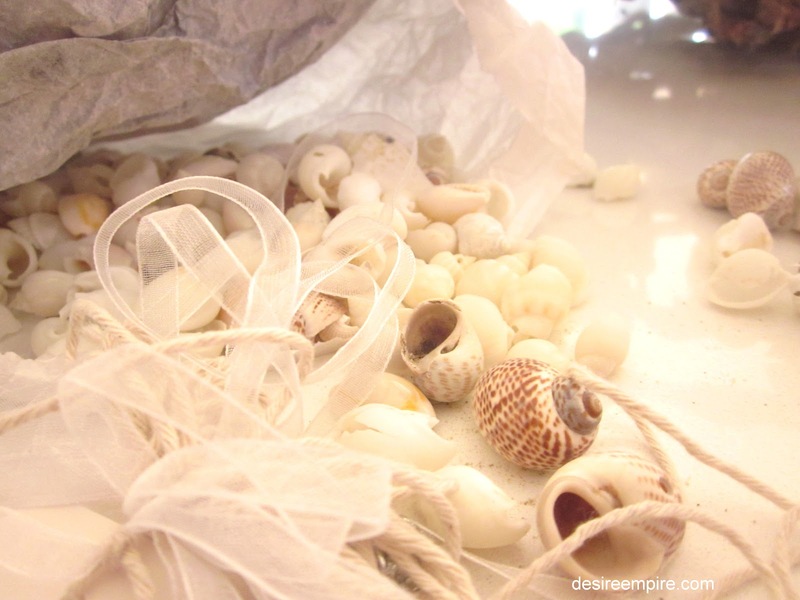 I have made little shell votive jars, vases and Christmas cards with shells from this bag and it is still going. This time I decided to stick some of these babies on top of toothpicks. That's right, this is how to give your Summer party a bit of coastal zing. You are probably asking now. Who could be bothered???? Well ladies this one is so simple and quick that you would be crazy not to give it a go. Just squirt a little glue into the shell and shove a toothpick up its bottom. What could be easier????? I have packaged these up in a little clam shell but if you don't want to go to that expense, you cold just tie them in little bundles with twine. I notice teacher appreciation week is coming up in the States as well and this gift might make you stand out from the rest. Simple elegant and so dang easy if you please. I love it! I actually have a bunch of these little shells I've been collecting over the years! What kind of glue did you use? I'm thinking plastic toothpicks so I can wash and re-use?? I'm not a DIYer, so any advice?? These look great, so easy to make! Might have to put an order in for Mother's Day with my crafty son! What a beautiful, easy idea. I love all things beach! 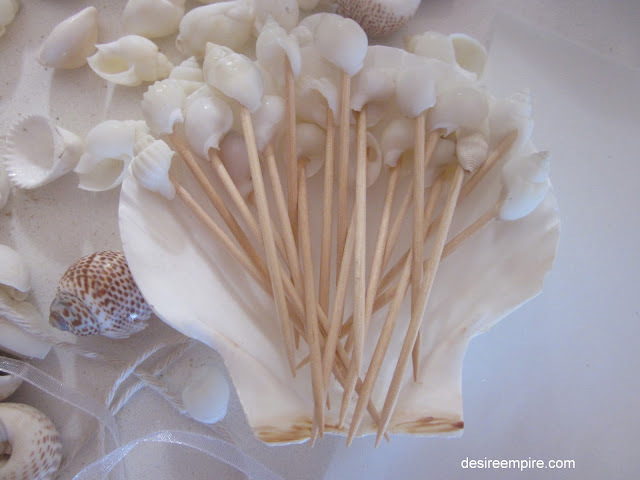 I bought heaps of shells over the summer to make my own shell artwork - a copy of some fabulous stuff I saw in Sorrento but in the same gorgeous shop they had the shell toothpicks already made up - so I cheated and bought them. They're a great hit, everyone loves them! These are so cute and would be great for appetizers! Love the idea! 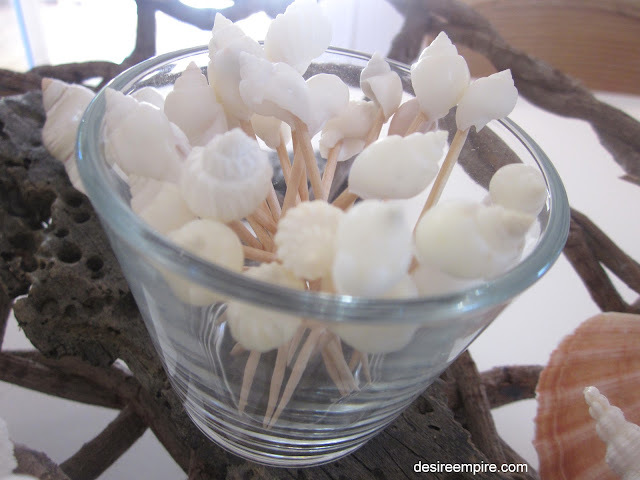 They are divine little shells and look so sweet on the toothpicks, but surely there must be another use for them. I couldn't stand watching people stick them in their dirty teeth then throw them out. Too pretty, so what else, maybe holding a club sandwich together? Must find a way to reuse. Little shells on toothpicks? Gorgeous!!! :) I must try it some time (just need to source some nice shells). You are good to have made the toothpick/shell thingies. I have to confess my preference is to buy such. Love the hubby story. Just enjoy this unexpected sweetness, whatever the reason! What wonderful idea and I would use it! So simple, unique and a conversation piece. Hi Carolyn, I found you at The Tablescaper. I love the toothpick shells. They not only make a nice addition to a table setting, they also make great little favors, especially if you use those in your setting. People will love having a packet of them to take home. 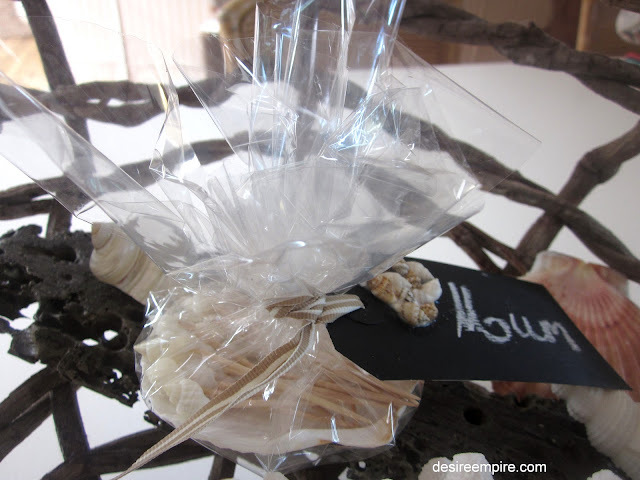 We wrapped them in cellophane and twine with a little manilla tag decorated with a beachy feel and gave them out to the girls who came to a wedding shower. The girls just loved receiving them. Thanks for sharing and reminding us that some of the most special touches are not all that difficult! Hope you'll stop by "my place" sometime too! What a fantastic idea! I would love to do this for the next get together we have. Thanks for sharing! I love your pretty home. And love the idea here. What a great idea...I love it. 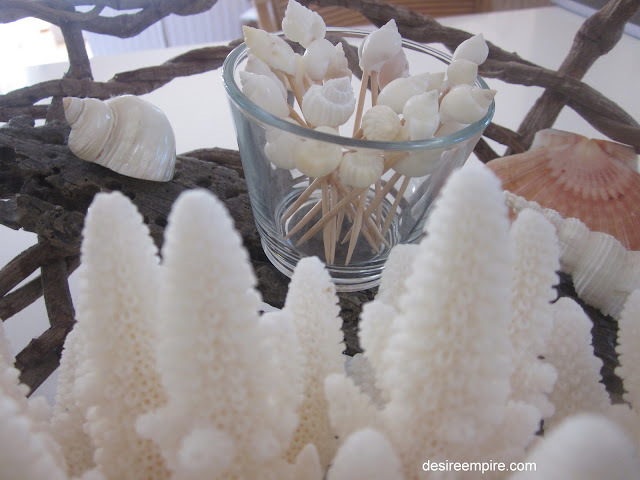 I love what you did with the cocktail sticks, I have some I purchased but the shells are the brown and white, yours are gorgeous in all white, great job! Very adorable little gift. any mom would love it. Add an olive and a martini and those little picks are perfect! Cute idea! I love coral. LOVE LOVE THIS!!! So creative and cuuute!!! The shell picks are perfect for summer. What a great project and so easy to make. I'll definitely make these. Thanks for the great tutorial.